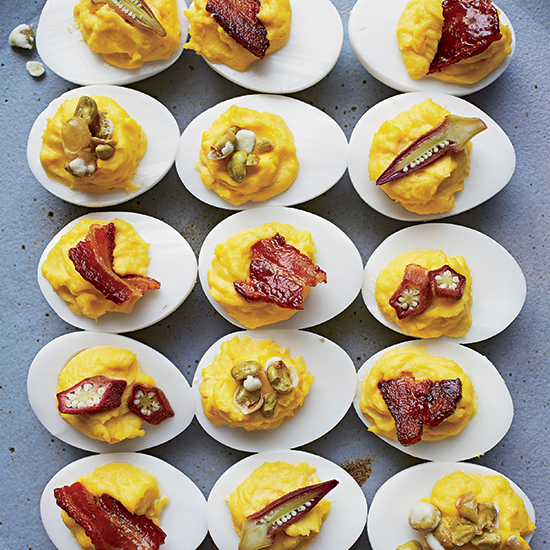 Toppings like wasabi peas and pickled okra are just a few of the ways to upgrade deviled eggs. James Peisker and Chris Carter bake their delicious thick-cut bacon (see recipe below) with sugar and chile powder so it comes out of the oven caramelized, crispy and utterly irresistible—the perfect topping for favorite Southern snacks like deviled eggs. In addition to spicy candied bacon, try topping deviled eggs with crushed wasabi peas or sliced pickled okra. For more recipe ideas, click here. Preheat the oven to 400°. Line 2 large rimmed baking sheets with foil. In a bowl, whisk 1/4 cup packed light brown sugar and 1/4 cup granulated sugar with 1 tablespoon ancho chile powder. Arrange 1 pound thick-cut meaty bacon strips on the foil and coat the tops with the chile sugar. Bake for 10 minutes, until sizzling and lightly browned. Spoon off the excess bacon fat from the baking sheets, then bake for 5 to 7 minutes longer, until crisp. Transfer to a rack set over a sheet of foil to cool; serve.